An increasing number of airlines are now flying the Boeing 787 Dreamliner, including Jetstar, but here's one part of the next-generation jetliner that no passenger will ever see. It's the funky 'loft' space used by pilots and flight attendants during their scheduled breaks from duty. On most conventional aircraft the crew use regular seats or a variety of private rest areas, but as Boeing regional director Kent Craver observes, "anything you can do to get non-revenue bodies out of revenue seats is a benefit for airlines". Besides which, Craver admits, "I've never found a passengers that's comfortable seeing a pilot sleeping!". Boeing's solution for the 787 Dreamliner was to create this 'loft' space above the main cabin, accessible by a small ladder. It's the same approach as on Boeing's long-range 777 jets. Here's a cut-away diagram showing how this space nestles above passenger seats and the overhead bins. A rest area dedicated to the pilots is located just behind the cockpit and sports one seat and two bunk spaces (below). The crew's snooze zone is at the rear, with six bunks. These admittedly 'close quarters' are not recommended if you suffer from claustrophobia (we felt uncomfortably confined after just spending just a few minutes spent in the loft space!) but you have to admit, it's a very cool and potentially shagadelic space! 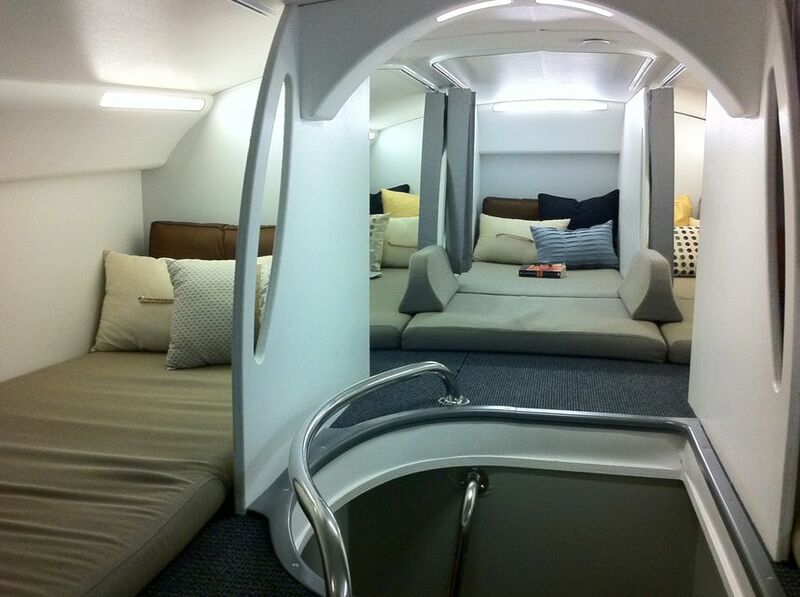 We can't help but wonder how long before an airline asks Boeing if they can install more of these bunks and start selling them to passengers as a space for group travel and private parties? Which airlines have this loft? These are something like the quarter berths on a yacht. These are berths which go underneath the cockpit seats and only your head is out in the cabin. Wonderfully comforatable and you cannot fall out in bad weather. We speculated some 20 years ago why long range aircraft did not have such a feature. My friend that I know very well has told me many a time how bad it is sleeping in one of those, well not that bad just uncomfortable, but this looks like the work of a United Airlines also. 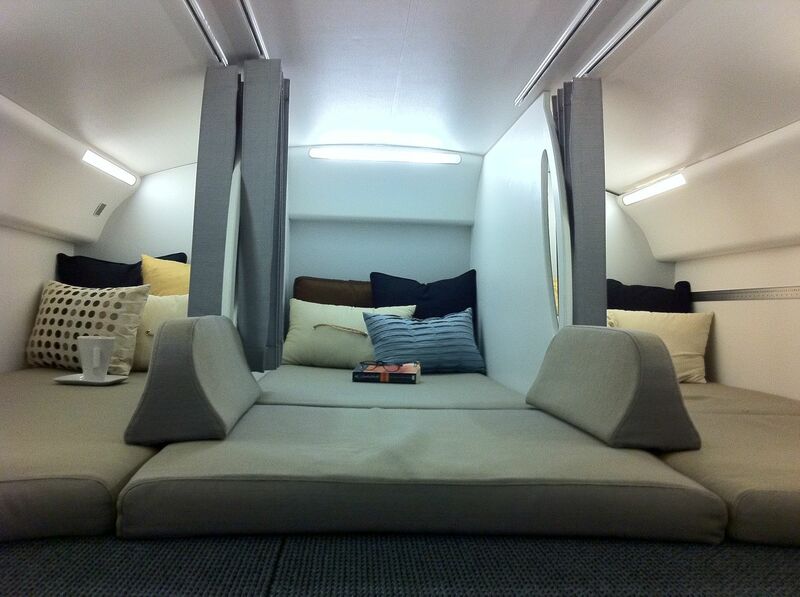 Comment on "Cool photos: inside the Boeing 787's funky crew rest 'loft'"